Several companies of Grupo Enhol operate in farming sector, primarily in the handling, sale and dehydration of forage. The group companies operating in this field guarantee the total control of all the processes involved, from the selection of seeds and growing, to harvest and distribution. Enhol sells most of these products internationally under the company named Liverco S.L. The Enhol Group company Liverco specialises in the efficient, quality distribution of farming products, more specifically fodder for livestock and seeds. Forage is dehydrated quickly at Liverco’s processing plants, which means that it retains high quality protein (lysine, methionine, cystine) and beta-carotene content, allowing the company to distribute fodder of outstanding quality, dehydrated in optimum conditions at the perfect moment. Enhol’s customers are, above all, dairy cooperatives, high-output livestock facilities and compound fodder manufacturers. Enhol has more than 4,500 hectares of crops, which yield about 50,000 mt of alfalfa. The Enhol Group companies devoted to this field are qualified to carry out all the agricultural work involved (preparation of land, sowing, phytosanitary treatment, irrigation and harvesting) in compliance with the most demanding quality standards, thereby guaranteeing that the product processed and distributed to customers is always the best. Productos Agropecuarios Hermanos Oliver, the original company behind the current Enhol Group, has always strived to stand as a reference point in the farming sector through its continuous process of innovation aimed at process and end-product quality: natural fodder and seeds. Its quality is guaranteed by the ISO 9001:2008 certificate. The Productos Agropecuarios Hermanos Oliver plant is now one of the largest forage dehydration plants in Spain, in terms both of production volume -capacity to process 80,000 mt of alfalfa a year- and the amount of land managed -4,500 Ha of crops. Productos Agropecuarios was the first dehydration plant to apply a continuous quality control system. The plant now has seven NIR analysers at the beginning and end of the each production line, a PLC network, continuous scales, counter and analyser networks and a supervision system (SCADA). This system allows to control levels of protein and moisture throughout the entire process, ensuring that the products meet the characteristics demanded by the customer. 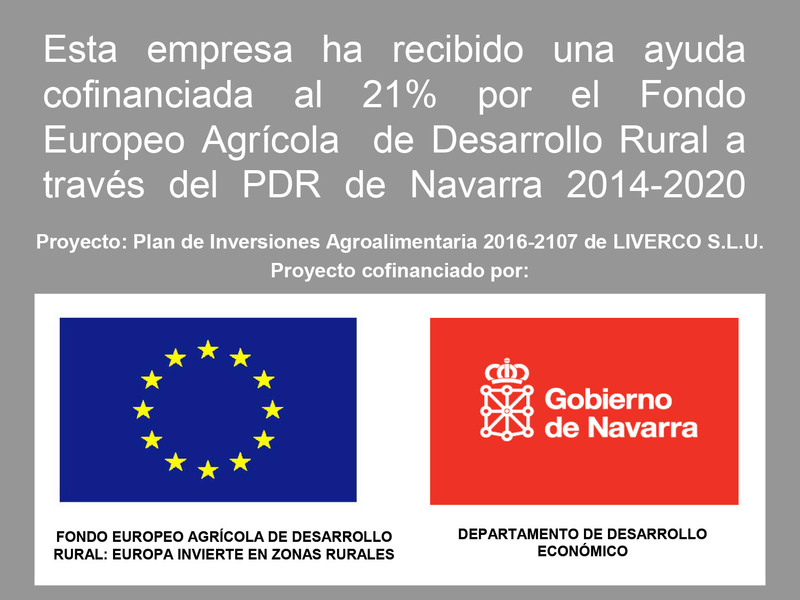 This company has received a co-funding grant at 21% rate from the European Agricultural Fund for Rural Development under Navarre RDP 2014-2020. Project: Agriculture and Food Production Investment Plan 2016-2107 by LIVERCO S.L.U.